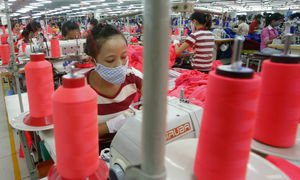 Decades of rapid economic growth has been a blessing for Vietnamese cities, as well as a curse in disguise. 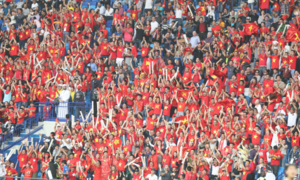 Asia is where most of the economic growth will happen, experts say, as Chinese villages turn into megacities and similar phenomena become evident across the continent, including Vietnam. The World Economic Forum has predicted that the next billion members of the world’s middle class will come from Asia. However, these impressive figures, the higher living standards and rising wealth generation have been accompanied by a disaster of unimagined proportions that both citizens and policymakers are not paying sufficient attention to, in terms of long term ameliorative measures. There is literally aplenty on the scale of the problems caused by rising levels of air pollution across the country caused by heavy industries and rapidly increasing number of motorized vehicle owners. Hanoi, Vietnam’s capital, only had 38 days of "clear air" (an AQI below 100) in 2017, with average pollution four times higher than those deemed acceptable by the World Health Organization's air quality guidelines. 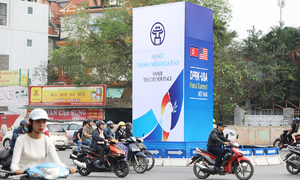 The Ministry of Natural Resources and Environment (MoNRE) has said that traffic is responsible for about 70 percent of air pollution in Hanoi. That air pollution is becoming a serious threat in many Southeast Asian nations has been evident for some time now. The WHO recently estimated that 4.2 million premature deaths globally are linked to ambient air pollution. Air pollution is a factor in more than 24 percent of the worldwide deaths from stroke, 29 percent of deaths from lung cancer, and about 50 percent of respiratory deaths and diseases. The most threatening facet of air pollution is fine particulate matter, often referred to as PM2.5, caused by exhaust emissions from vehicles, factories, fires, etc. Particles (smaller than 2.5 micrometers) can get deep into the lungs and even into our bloodstream. The length of exposure, concentration, as well as a person’s age, are all factors related to how particulate matter can negatively impact health. Short-term effects include irritation in the eyes, nose, and throat, headaches, nausea, allergic reactions or upper respiratory infections such as bronchitis and pneumonia. Long-term health effects vary from chronic respiratory diseases, lung cancer, heart diseases, to damage in the brain, nerves, liver, or kidneys. The danger of air pollution is invisible and insidious, affecting even very healthy people. People who are most at risk, experts say, are children, fetuses, people with chronic respiratory and pulmonary illnesses, and the elderly. According to the HCMC Environment Protection Department, the city has the highest number of motorbikes in the world – 7.3 million – and more than 600,000 cars, which consume in total over four million liters of fuel a day. Saigon’s particulate pollution is above the worldwide average, but below average in comparison with other Southeast Asian cities like Bangkok, Manila or Jakarta, which suffers the region's worst air pollution. 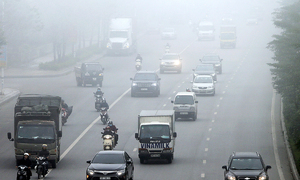 Most people in Vietnam aren’t aware of the health risks from ambient air pollution. 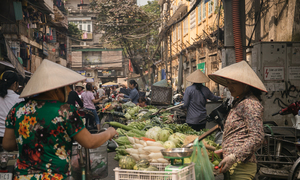 Education about effective protection and best practices against pollution exposure has only reached a small minority of Vietnam’s population. Most Vietnamese people driving on the roads wear cotton masks, which are effective against the sun’s UV-rays, but are not effective against particulate matter, filtering less than 10 percent of PM2.5 and don’t seal properly. 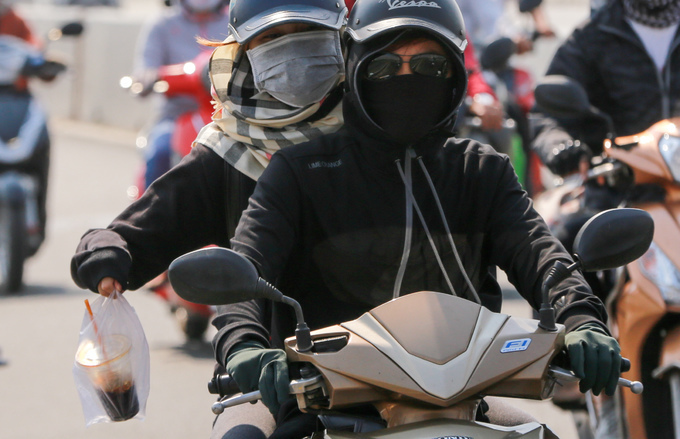 Another popular choice for motorbike riders in Vietnam are surgical masks. Mainly used in hospitals, these masks are designed to keep illness from spreading as liquid droplets, but aren't effective at filtering PM2.5 because they don’t seal completely around the face. Additionally, these masks are discarded quickly and contribute to plastic waste. Both cotton and surgical masks provide a false sense of security for people concerned about air quality. According to the WHO, six out of 10 diseases with the highest mortality rate in Vietnam are linked to ambient air pollution. 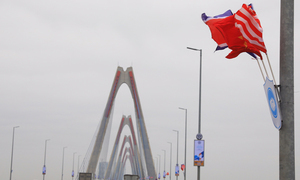 Le Viet Phu, an economist with Fulbright University Vietnam, said that the annual number of deaths due to air pollution will rise up to over 100,000 by 2035. Furthermore, economic losses due to early deaths caused by air pollution accounted for an estimated 5-7 percent of Vietnam's GDP or $11.4-15.9 billion last year, with at least 40,000 people dying of diseases related to air pollution. 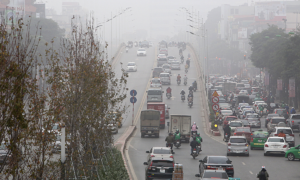 Pressured by the WHO and organizations that support people who suffer from respiratory diseases, the Vietnamese government recently launched a national action plan on controlling air quality until 2020 with a vision to 2025. The plan assigns ministries and agencies with implementing many solutions to curb air pollution, including green production, investment in new, green technologies, installing additional air monitoring stations, and limiting the use of obsolete technologies in production. 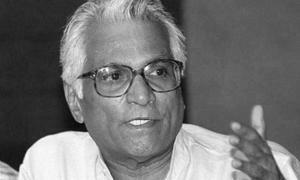 However, both residents and policymakers cannot be satisfied with steps taken thus far. Just as products like air pollution masks with electrostatic filters are mere temporary solutions for a serious problem, policies such as those enumerated above are not going to be effective in the long run. 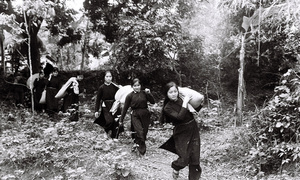 In the long run, Vietnamese cities need large infrastructure changes on an emergency basis, whether it is the promotion of public transportation, reduction of private transportation means, scaling back industrial agriculture and livestock farming to organic production, or avoiding dangerous technologies like GMOs. 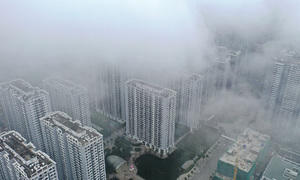 If this does not happen soon, Vietnam’s megacities will not be able to foster a healthy lifestyle for their residents. *Anton Hansen is a German working and studying in Ho Chi Minh City. The opinions expressed here are his own.